Here’s one for the list of “movies you shouldn’t leave the world without seeing.” At least, that’s the message I’m getting. Why a piece of accidental suspense (the tension is built by not seeing the shark, and they only keep the shark offscreen because it looks fake) is worthy of 35 years and counting of praise is something I don’t quite understand. The New England resort town of Amity begins experiencing shark attacks, inducing a panic. 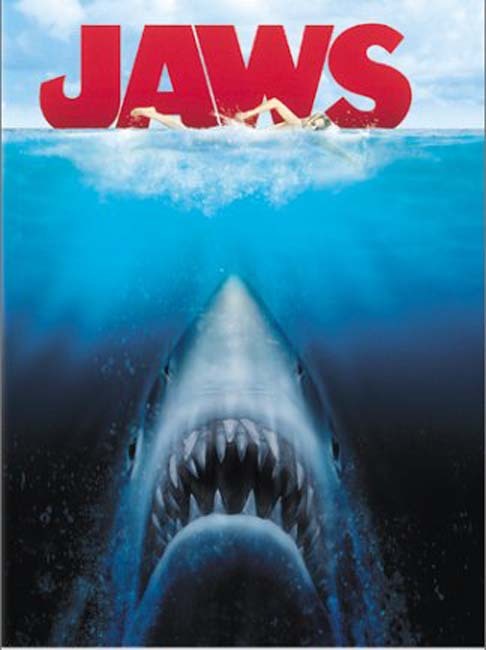 Police chief Brody tries to keep everyone safe, book smart shark expert Matt Hooper comes to town to confirm what kind of shark is menacing their waters, and street-smart seaman Quint offers to kill the shark for a large sum of money. When Hooper discovers they have a Great White maneater on their shore, the three fight to get approval from the mayor to go hunt it down. But a great white doesn’t die easily. This seemed like two different movies to me. The first hour is about the mysterious presence in the water, the panic it causes, and the little guy nobody believes trying to save everyone. Once Quint gets contracted, it’s like a battle between a submarine and a sub destroyer. For a large part of the boat half, I wasn’t worried about the shark at all. They had time, and they’d get him eventually. A lot of male bonding occurs on the boat, and I was sorry to see so little of the story devoted to the friendship between the scholar, the fisherman, and the observer, which is what Brody is for most of the movie, especially once Quint and Hooper get together. I didn’t care very much about him, and learned not to expect much of him. He only has two major contributions to the story, and I felt more like I was just supposed to experience it through him. Having heard the story of the shark, I couldn’t imagine why the filmmakers thought it would be a good idea to show it much before seeing it, and having seen it, it makes even less sense. I cannot accept the idea that storytellers only realized that the unseen is more frightening than the known quantity in the last thirty years. Watch this movie: at the beach. It’s more interesting than tanning. Don’t watch this movie: just for Shark Week.